Salad plate handcrafted of porcelain. Porcelain salad plate. 8.25"Dia. 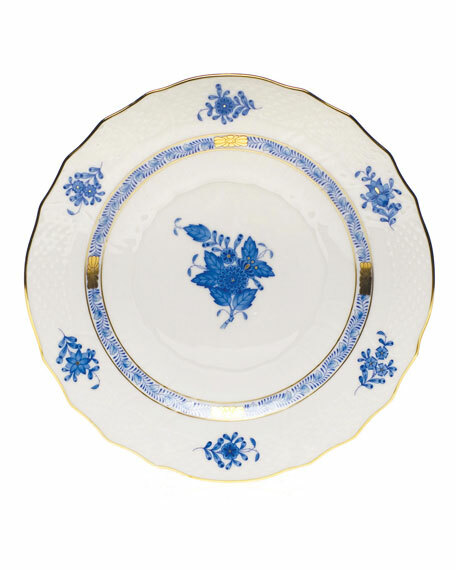 Bottom of plate detailed with hand-painted butterfly motif. Hand wash. Made in Hungary. White porcelain with multicolor hand-painted ivy and insect design. Goldtone trim. Handcrafted. 7.75"Dia. Hand wash. Made in Hungary. This is a special order pattern. If not in stock, please allow up to 4 months for creation and delivery. Purple, blue, and yellow salad plate. Hand-painted porcelain. 7.5"Dia. Hand wash. Made in Hungary. This is a special order pattern. Purple, blue, and yellow salad plate. Hand-painted porcelain. 7.5"Dia. Hand wash. Made in Hungary. This is a special order pattern. If not in stock, please allow up to 4 months for creation and delivery. Handcrafted porcelain salad plate. Hand-painted 24-kt. gold band. Dishwasher safe. Made in Portugal.